This year I'm participating in Doing Dewey's Book to Movie Challenge and Winter's Bone is my second book/movie of the challenge. Winter's Bone was one of those films I heard so much about when it came out, but for some reason I never got around to seeing it. This challenge provided the perfect opportunity to do so. I read the book first and then watched the film to compare. Set in the Ozark Mountains, this novel follows the story of sixteen-year-old Ree Dolly who is busy looking after her sick mother and two younger brothers. When her father runs off and it appears he won't show for his court appearance the following week, Ree must go looking for him. Her father, Jessup, has put their house up as his bond. If Ree can't find him the family will lose everything. Unfortunately for Ree, trying to get a straight answer out of her tight-knit, feuding community puts her and her uncle Teardrop in danger. The plot is a fairly simple one and there were no surprising twists in this story. It's not that kind of novel. Where the novel does excel is in its rich descriptions of place, which creates a cold and fierce atmosphere as you read. Woodrell lives in the Ozarks and it is pretty obvious from this book that he has a love of this environment. Winter's Bone is essentially a long commentary on the people of Ozark and the mountains themselves, with a small storyline thrown in! The wintry landscape really does come alive in the novel. The Ozark's feature as prominently, if not more so, than Ree herself. There are many scenes of Ree interacting with her environment. For example: sleeping in a cave, hunting squirrels, trudging through the snow. I enjoyed reading about Ree. It's refreshing to see a strong female character, someone willing to stand up for herself. Although one tiny thing that bothered me was Woodrell's insistence that Ree get around in long skirts all the time. It's freezing cold for the entire novel and she's wearing a skirt? I found that distractingly unrealistic. Winter's Bone is a slow-paced ramble through the Ozarks. There are moments of danger and violence, but in my opinion the novel never felt like a thriller or a mystery. It's too slow for that. This book is about a place and a girl. It's a well written and engaging novel. While the story didn't blow me away, it did capture my attention. I enjoyed reading it. I'm a big fan of Jennifer Lawrence and I think she did a superb job in this film. Although it's hard for me to say whether she truly captured Woodrell's Ree perfectly because I was already picturing Jennifer the entire time I read the novel! Still, she's a great actress and this role demanded a lot from her. She definitely delivered. John Hawkes was also brilliant as Uncle Teardrop, a man as hard and brutal as the rest of the Ozark men, and yet he shows his kindness as well. While the film does follow the book's major storyline, there are a few differences. In the film Ree's younger siblings are one boy and one girl, instead of two boys. Ree is seventeen in the film. And she doesn't wear a skirt, which I was pleased to see. There are a couple of extra scenes added (a school scene and Ree speaking to an Army recruiter), while an important aspect of the novel - namely Ree's close relationship with her friend Gail - isn't given enough depth or screen time in the film. Something that bothered me from the very opening of the film was the lack of snow. 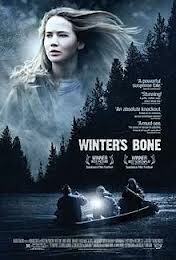 The story is called Winter's Bone after all, and in the novel the winter snow is almost a character in itself. The novel is all about the landscape and the cold. I assume that when the film was being shot there wasn't snow on location, so I can understand why it's not there. But in my opinion the film loses so much of what made the novel so great. Without the snow, I didn't get a real feel for the 'winter' of the film and for me it took something significant away from the story. A perfect example is a scene near the end involving Ree and a lake. I won't spoil it for those who haven't seen the film or read the book, but let's just say the lake needed to be iced over and in the film it wasn't. I didn't get a strong feel for the landscape in the film. It was more about the people, which is fine for a movie. I enjoyed watching the story come to life onscreen and seeing how the director interpreted the many harrowing interactions between Ree, Teardrop and the feuding community members. Although the film didn't have time to give the community characters much depth, it didn't really matter because just like the book - this is Ree's story.